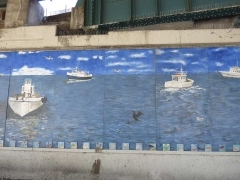 Sheepshead Bay is well-worn territory for Forgotten NY — my first comprehensive page on the neighborhood appeared in 2006, and earlier this year I posted an account of my very first trip to Dead Horse Bay which I accessed from Sheepshead Bay. 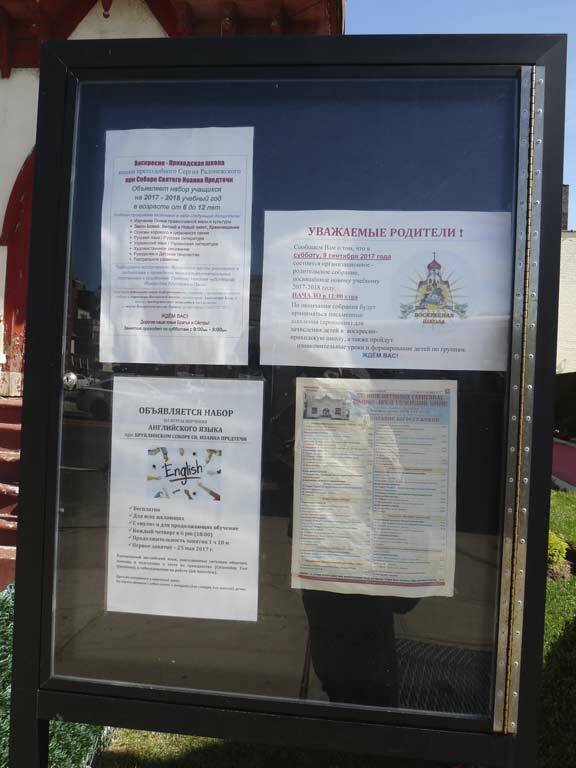 I’ve posted dozens of items on Sheepshead Bay…just use the Search box on the FNY homepage to find them. 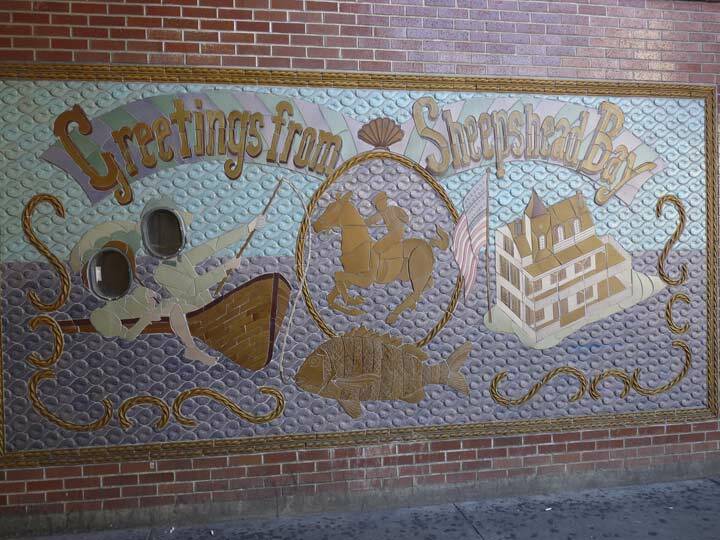 I have been aware of Sheepshead Bay from childhood. When I was a kid I thought the word was pronounced “sheep-shed” because the s and h are together, but this is one of the few words in which they’re in separate syllables. The bay is named for a variety of fish that no longer inhabits the bay for which it is named and is now more common in Southeast waters near Florida. When I was a kid my parents and I never made quite as many bus forays into Sheepshead Bay as we did to places like Coney Island and Prospect Park. 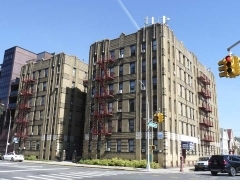 Part of it was because the buses that went there at the time, the B1 (Bay Ridge Avenue, or 69th Street) and B4 (Bay Ridge Parkway, 75th Street) weren’t as close to our apartment building on 83rd Street; the B1 has since switched to 86th Street, with the B64 moving to Bay Ridge Avenue and 13th Avenue. 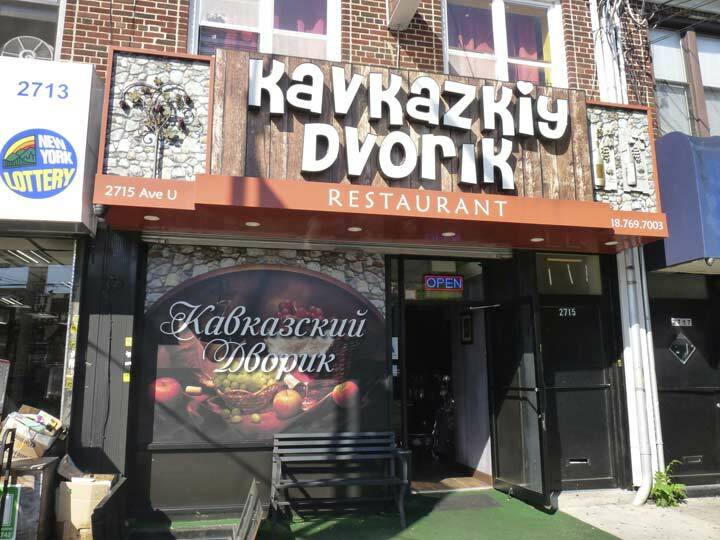 So Sheepshead Bay retained an unknown vibe and the thrill of umplumbed territory (there is actually a Plumb Beach east of Sheepshead Bay which is well-plumbed by now). Our rides, though, never extended to more far-flung locales such as Marine Park and Bergen Beach. That would have to wait until I began bicycling all over Brooklyn beginning in the 1970s. I was like Marco Polo journeying to regions heretofore unsuspected in Bay Ridge. Then I went to high school and college and met actual residents of these rumored locations. In the 1970s, Sheepshead Bay, Marine Park, and Bergen Beach had not become fully homogenized into the Brooklyn “beautiful mosaic” and were still rough around the edges in spots. There were lanes that led nowhere (still are if you know where to look), empty lots, and occasional unpaved roads. Much of this has been smoothed over in the 40 years since, but I can still recognize signs of when this was a separate town in Kings County. 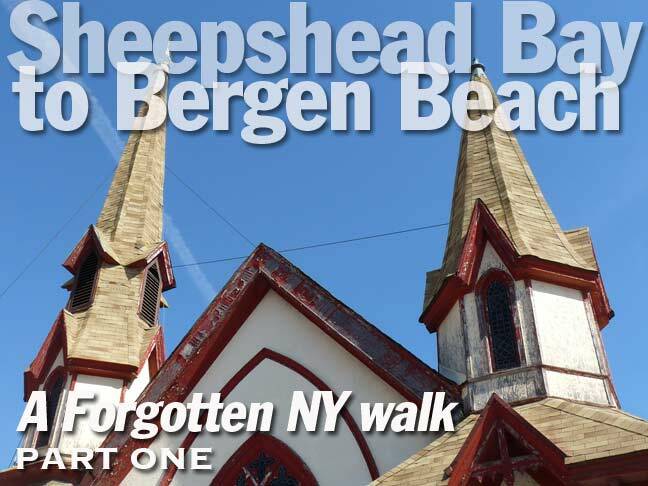 I have not made many forays into Marine Park or Bergen Beach — the last was in 2008(!) when I wound up in Georgetown, so although I have a lot of photo albums in the ForgottenQueue, I decided to use this batch, obtained in October 2017, right away. My favorite FNY forays always seem to be in Brooklyn as it was originally my home borough, though I have been based in Queens since 1993. De-training at the rear end of the Sheepshead Bay station, I was sure to get some photos of the old-style BMT lamp stanchions. These are actually reproductions of styles used in the early 1900s on subway platforms. They have recently had bright white curly bulbs installed; I’m unsure if these are LED lamps. However, these are not reproductions of lamps that had previously appeared on this platform. This 1970 photo from NYC Subways proves the point. 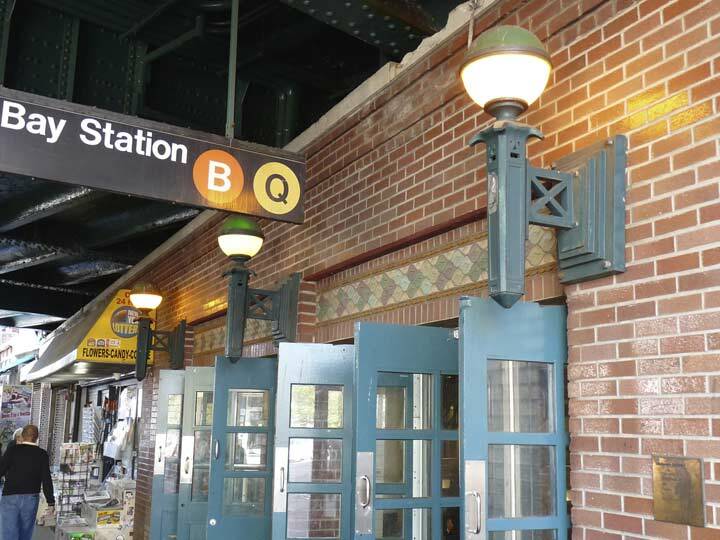 The current lamps were installed during a 1998 station renovation. 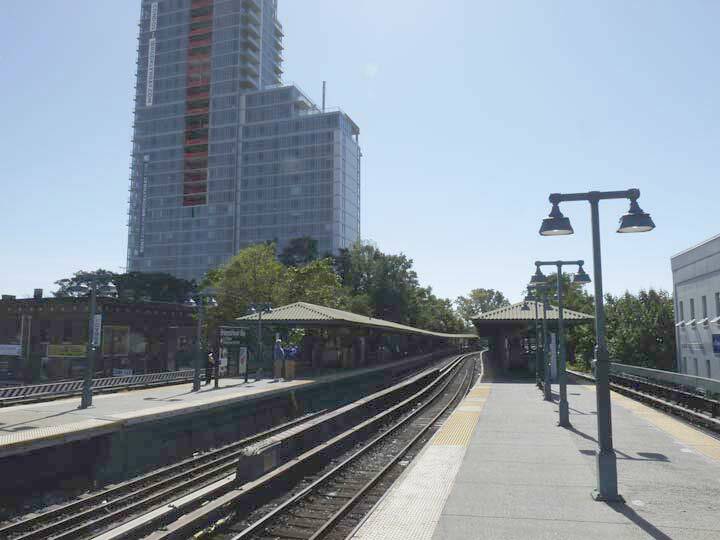 Though the Sheepshead Bay station has been described as having something of a down-home or small-town atmosphere, that “vibe” has been severely compromised by the nearby construction of Sheepshead Bay’s first glass-tower high rise apartment building. 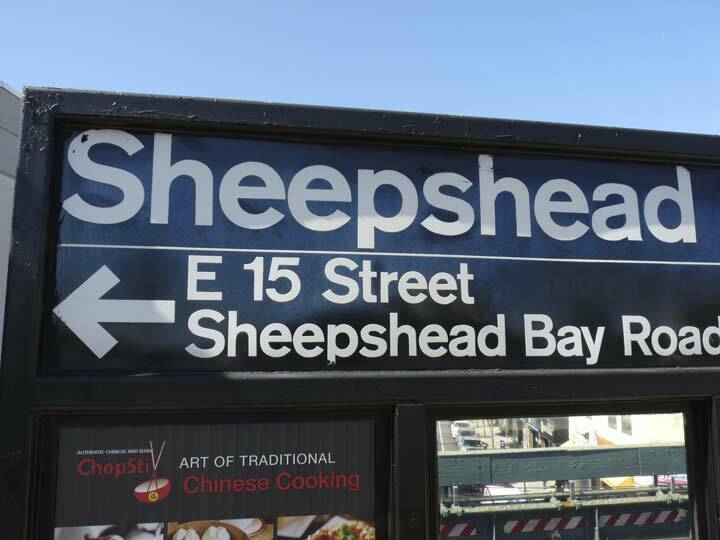 Sheepshead Bay’s 1998 platform signs are still in place, using the Standard front (in Germany, Akzidenz Grotesk) the MTA formerly used before their original preference, Helvetica, became available. One of my favorite aspects of the subways is the varied typography. 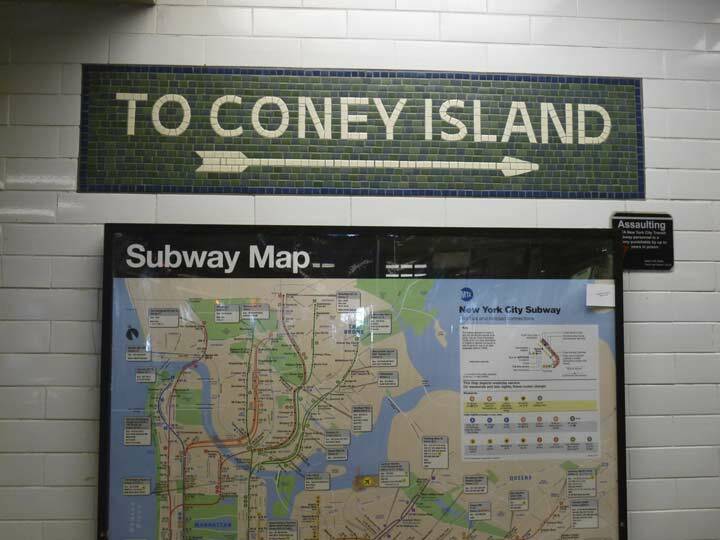 The Professional Organization for Design has published a comprehensive account of subway typography, and there’s an entire website and book (which I have, of course) devoted to the subject! I’m a Standard guy all the way, but mainly because I think Helvetica is continually overused. 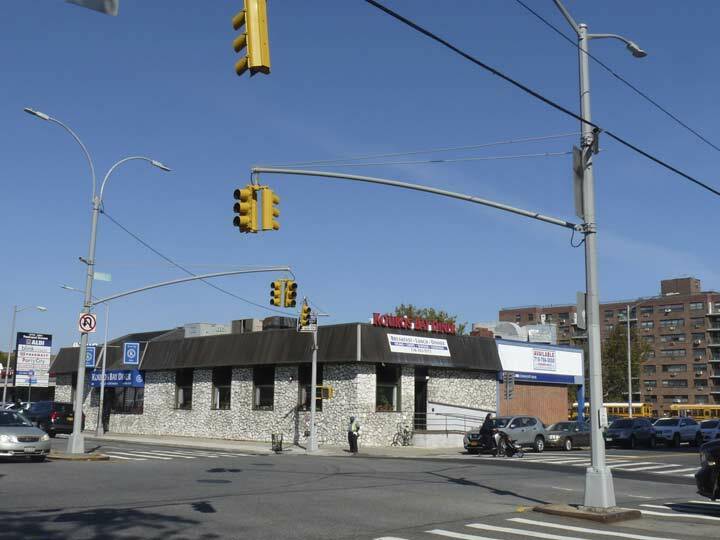 Sheepshead Bay Road, and its collection of Type G telephone pole lamp masts, runs under the station platform. 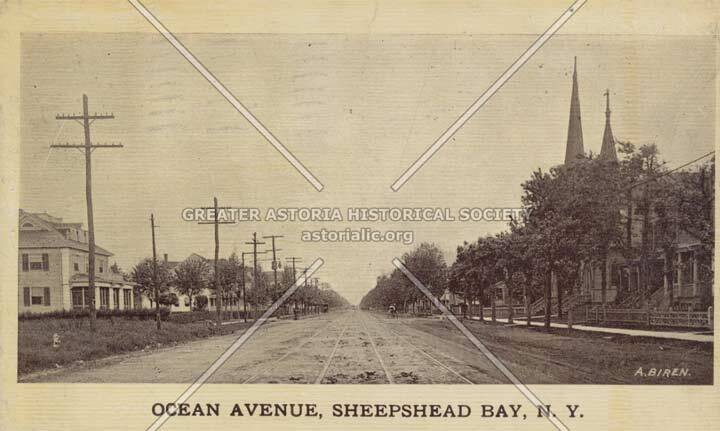 Did you know there are two Sheepshead Bay Roads in Brooklyn that used to be connected? The comprehensive FNY story is here. 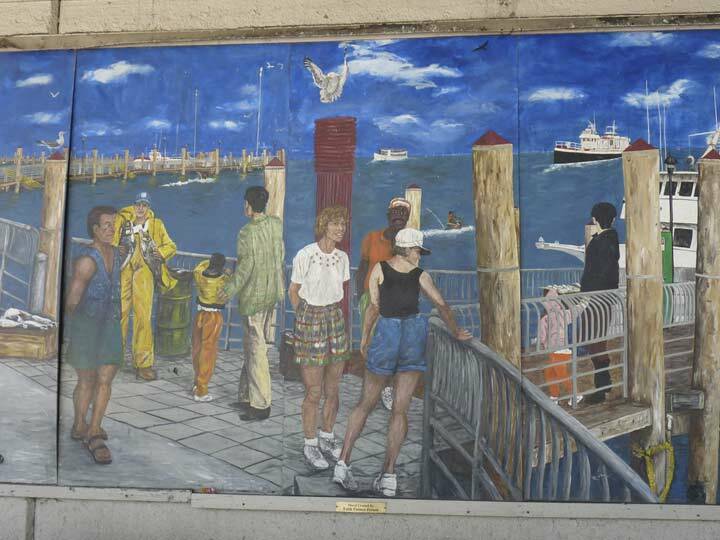 During station renovations in 1998, DeBorah Goletz’s ceramic artwork installation, Postcards from Sheepshead Bay, first appeared. 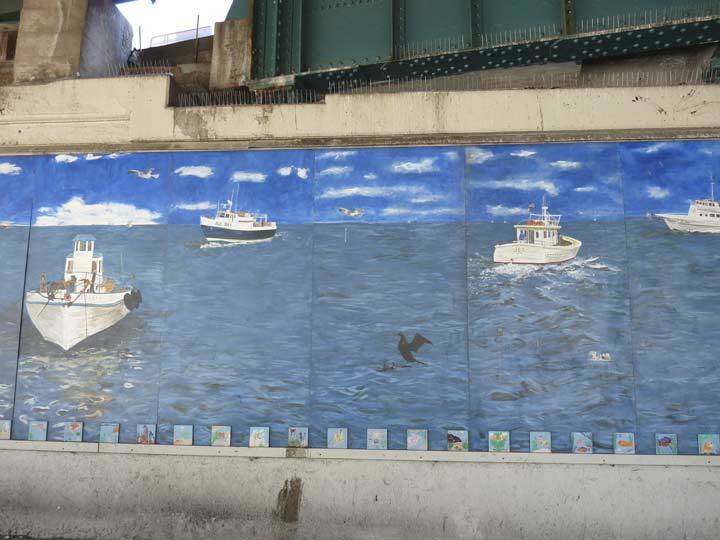 Her imaginative ceramics depict scenes of Sheepshead Bay in the good old days including fishing piers and restaurants. 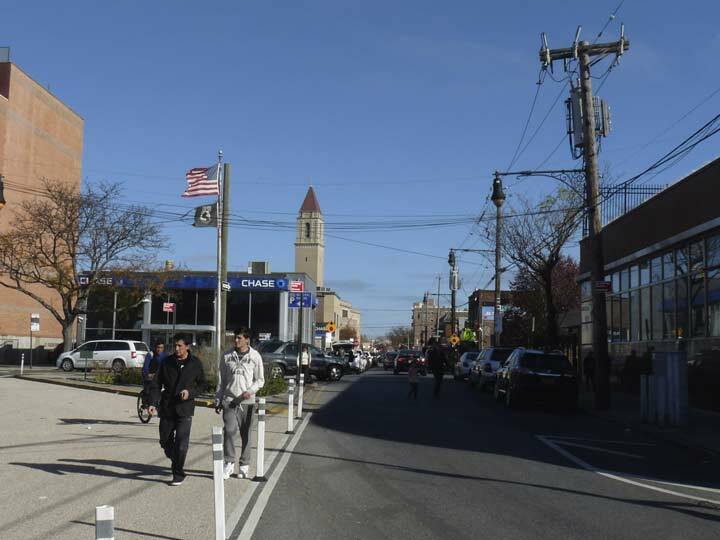 This piece on Sheepshead Bay Road has two holes for passersby to stick out their heads for amusing photographs. 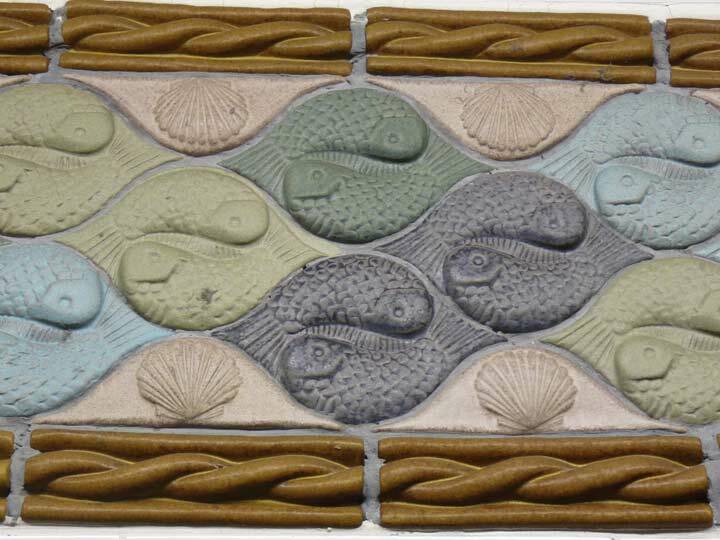 A consistent theme in the pleasantly pastel wall panels are depictions of fish, seashells and ropes used on fishing vessels. 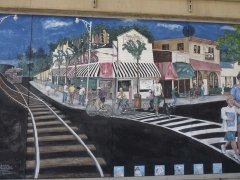 Goletz’s bay scene shows the wood Ocean Avenue footbridge. 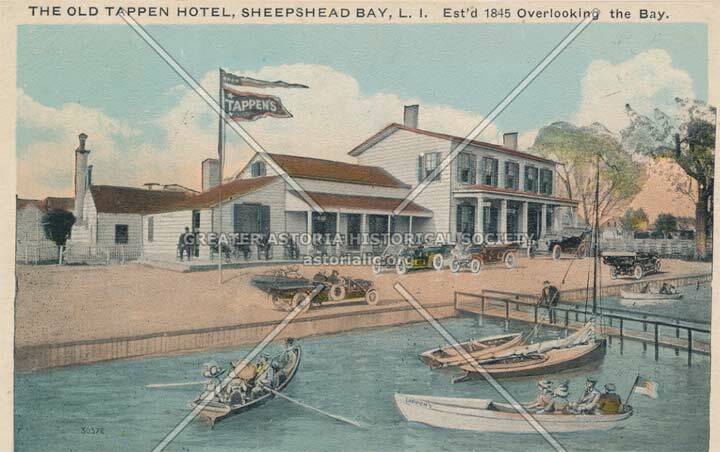 One of the establishments depicted on Emmons Avenue, Tappen’s, had a lengthy history in Sheepshead Bay. 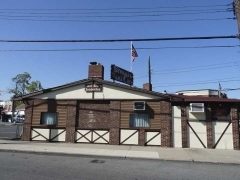 It was a hotel and restaurant founded in 1845 by Jeremiah Tappan as a roadhouse and tavern in Sheepshead Bay’s early period as a fishing village. Some accounts have Charles Dickens of literary fame sampling the oysters during a NYC visit. By the late 1800s, Diamond Jim Brady, the famed gourmand, and girlfriend Lillian Russell were dining there. 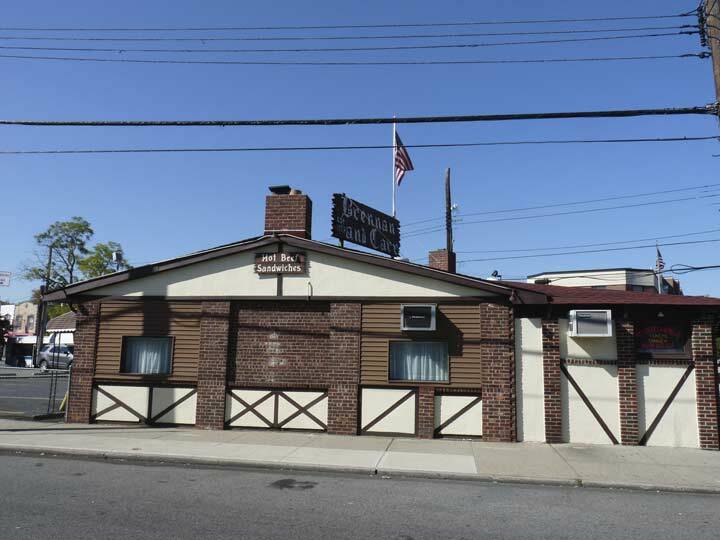 After a fire in 1950, Tappen’s reopened in the former Villepigue’s on Ocean Avenue and survived until 1971; the Villepigue family operated Tappen’s for a time. 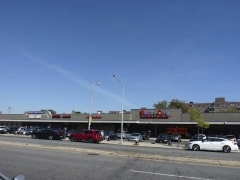 Of course, Tappen’s more famed competition, Lundy’s, held down the corner of Emmons and Ocean survived for decades until the 1970s, opening again briefly in the 1990s. Its Spanish Colonial building, now used for a number of businesses, remains in place today. 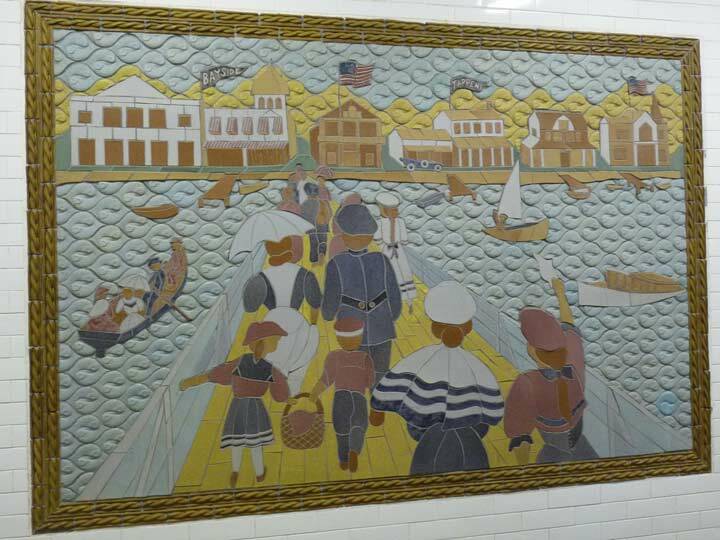 Another banner in the ceramic piece says “Bayside.” It represents the Bayside Hotel, one of Sheepshead Bay’s many waterside hotels built in the 19th Century. 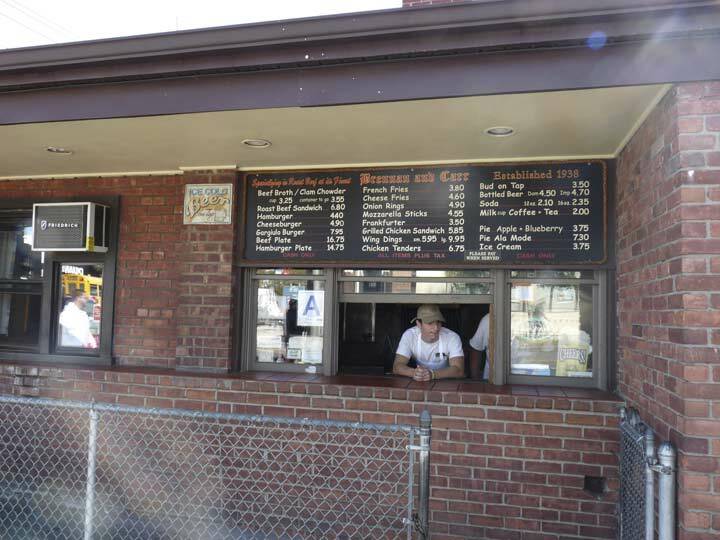 Today, the Lundy’s restaurant building occupies its old space at Ocean and Emmons. Artwork from Greater Astoria Historical Society. Here’s a postcard view of Tappen’s and the wood footbridge. Note how Emmons Avenue comes right up to the edge of the bay. 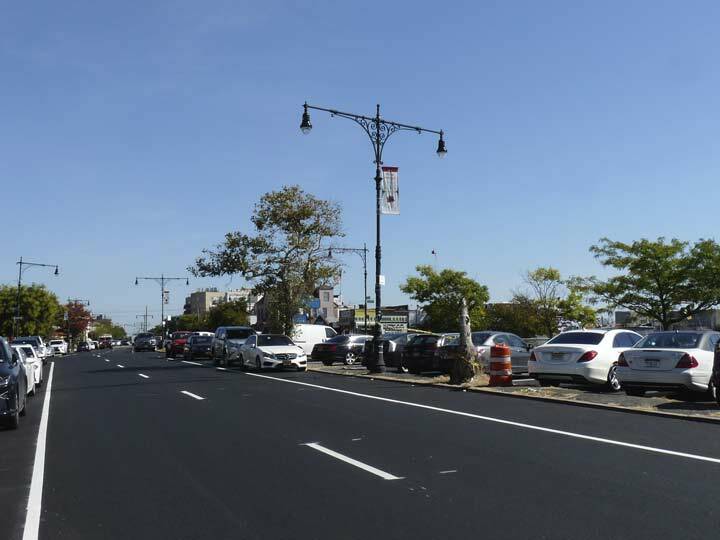 Sheepshead Bay was not lined with concrete bulkheads until the mid-1930s, with Emmons Avenue widened about that time, with the Belt Parkway soon following. 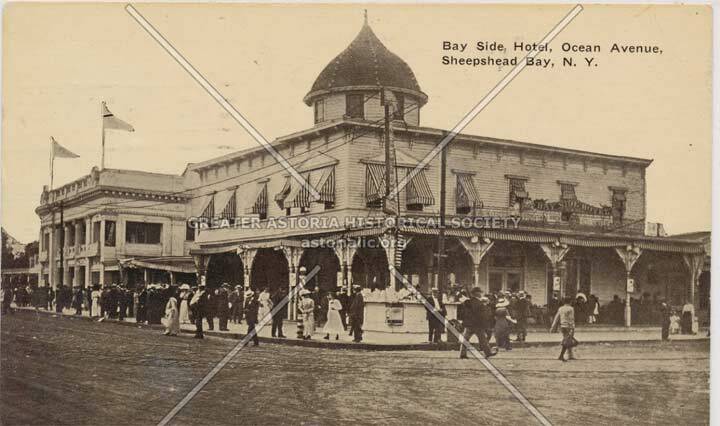 These postcard views of Sheepshead Bay, BTW, as well as many other NYC locales, are available for purchase without the watermarks at GAHS Images. 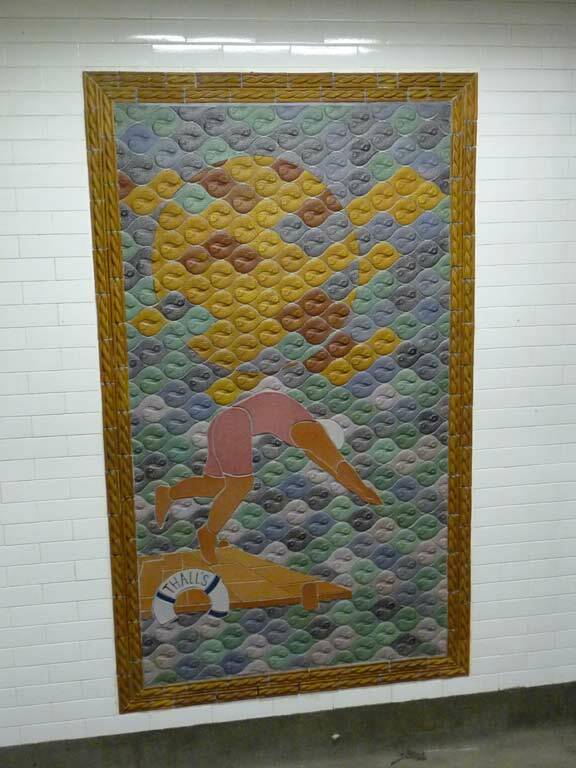 Another Goletz ceramic in the Sheepshead Bay station depicts Thall’s Bathing Pavilion, which was popular at the bay in the 1930s, famed for its diving competitions. 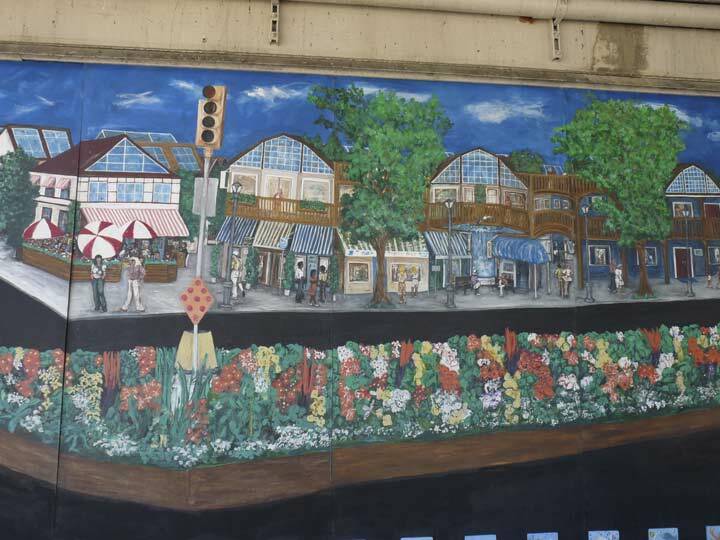 The 1998 station renovation included new mosaic directional signs in the Arts and Crafts style designed by Squire Vickers and used in stations built between 1908 and 1928. These torch-style station opening indicators (green means open 24/7) were originally designed for IND stations, which opened between 1932 and 1950. 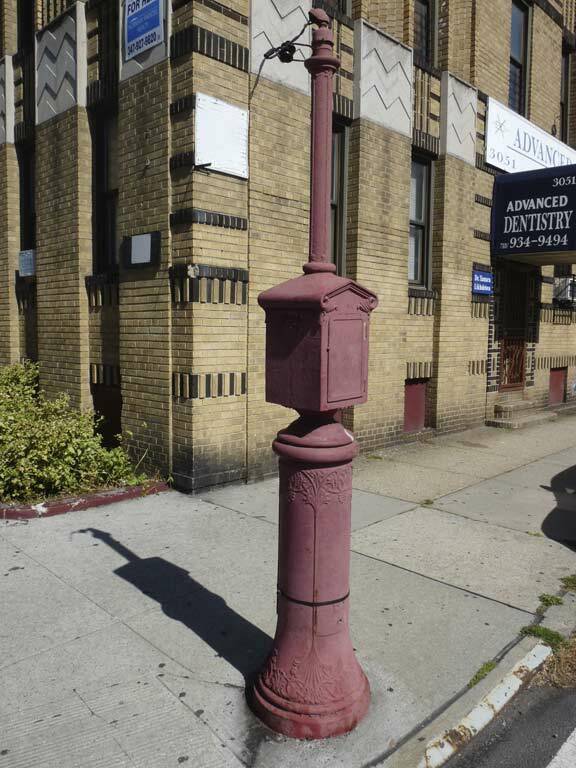 Eventually such stanchions, whether free-standing or wall-mounted, were used for all stations; the IND delineation became moot after 1940, when the city purchased the previously privately operated routes the IRT and BMT. 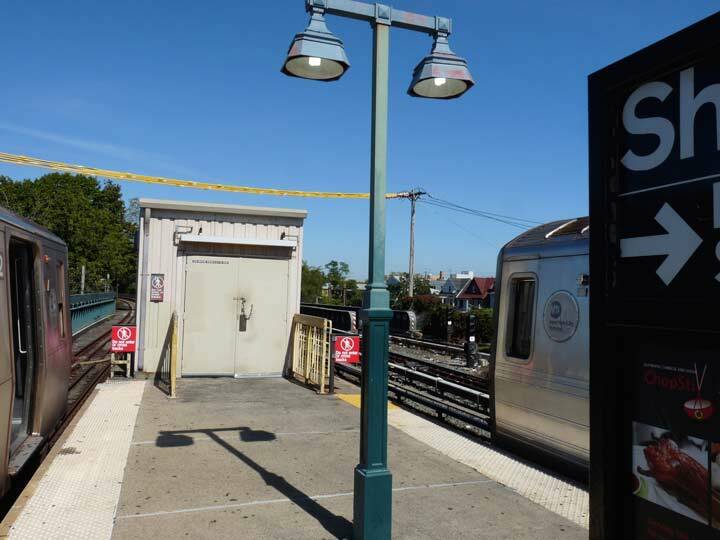 To be exact, the Sheepshead Bay station, originally part of a steam railroad, the Brooklyn, Flatbush and Coney Island, was electrified and later operated by the BMT, or Brooklyn-Manhattan Transit, and opened in its present status in 1918; there had been a steam railroad stop beginning in 1907. 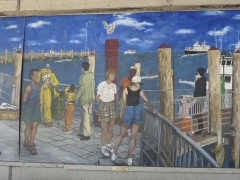 An engaging mural by Faith Palmer-Persen appeared on the East 15th Street wall between Avenue Z and Sheepshead Bay Road beginning in 1994, depicting her version of what she believed Sheepshead Bay would become in the early 21st Century. That is likely Palmer-Persen herself with the camera in front of Lundy’s. 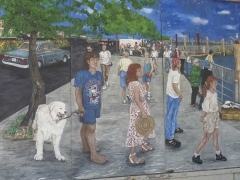 Sadly, the artist passed away at the young age of 49 in 2009, and Sheepshead Bay itself hasn’t really evolved to fit her vision, as cars still dominate Emmons Avenue and much of the local color, with places like Lundy’s and Pip’s Comedy Club, has vanished, and trolleys have not made a comeback. 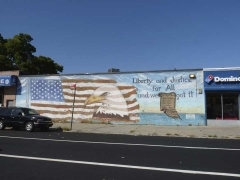 I had read somewhere that this ancient building on Sheepshead Bay Road, festooned with ads and signs, was in danger of being torn down for a high rise; the high rise is going up, but a block away on Shore Parkway. 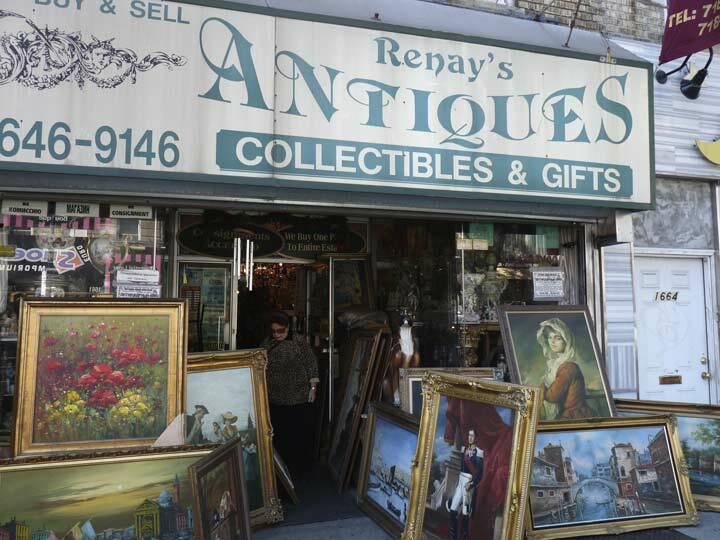 On a sunny 75-ish day Renay’s Antiques had set up a variety of available paintings on the sidewalk. Are any of these knockoffs of famous artists or “grand masters”? 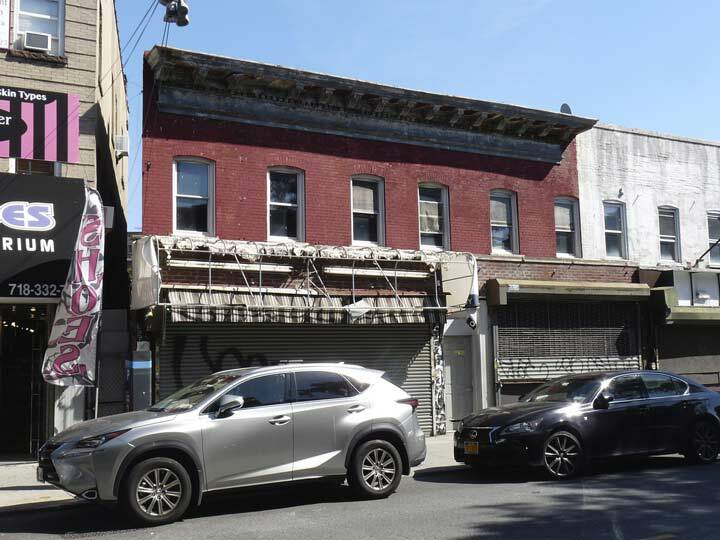 1663 Sheepshead Bay Road, just north of Jerome Avenue, one of the rare buildings on this stretch that looks the same as it must have in the 1920s. Across the street is the former Sheepshead Bay Theatre. 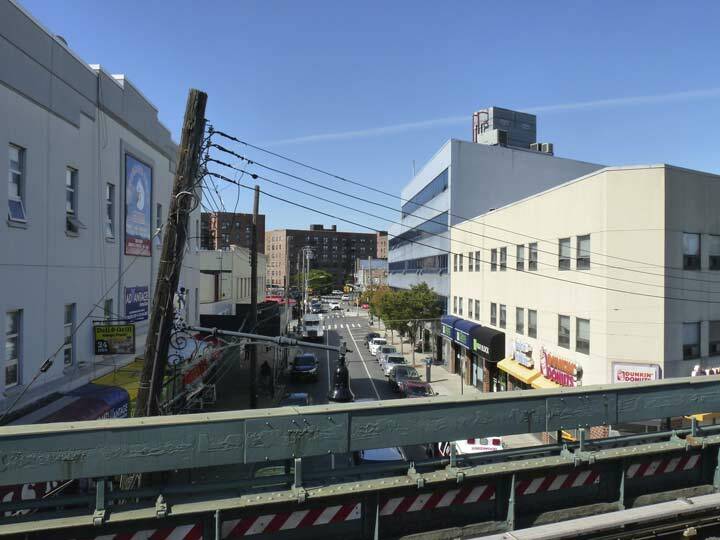 Jerome Avenue runs for a few blocks diagonally from Sheepshead Bay Road to Avenue Z. In the early 20th Century it was one of the few through routes in Sheepshead Bay and ran along the south end of the Coney Island Jockey Club, one of two race tracks in the area. After horse racing was outlawed in 1910, the track was used as a motor speedway and even hosted rodeos for a time! 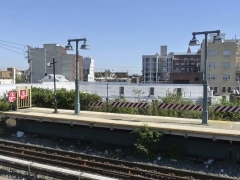 However, after owner Harry Harkness (for whom a Sheepshead Bay avenue is named) went bankrupt in 1917, the old track closed and the area was developed residentially; no trace remains today. 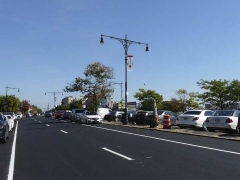 I would imagine the avenue was named for Leonard Jerome, the NYC financier who developed the Jerome Park racetrack in the Bronx; perhaps he had something to do with the Sheepshead Bay track. It overlays a colonial-era dirt path called Voorhies Lane. I promised myself I wouldn’t go down the “then and now” rabbit hole, but this view of Jerome Avenue and East 17th Street is fascinating. The Long Island Rail Road Manhattan Beach Branch once ran down the middle of the street, which is still wider than its parallel East streets. Railroad crossing gates can be seen on the left. 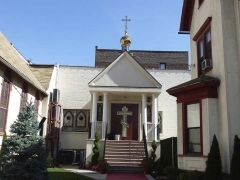 In the background is St. Mark’s Church, the oldest Roman Catholic parish in Sheepshead Bay, organized in 1868. The present building with its lofty campanile was completed in 1931. The same scene today, looking east from Bill Brown Square at Jerome Avenue and East 17th. 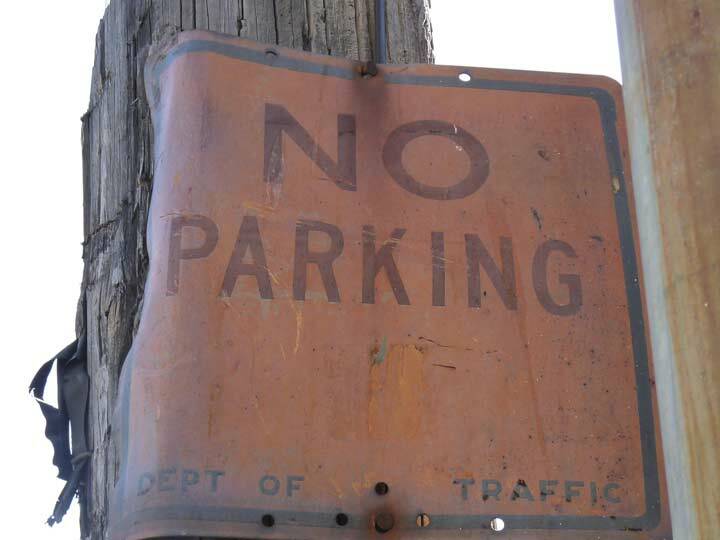 This ancient Department of Traffic No Parking sign remains at the SW corner of Sheepshead Bay Road and Voorhies Avenue. Oops, now they know about it. 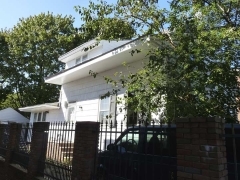 This mini-Parthenon, on 1811 Voorhies east of Sheepshead Bay Road, became rundown over the decades and by the 1990s became known as Sheepshead Bay’s Hell House. 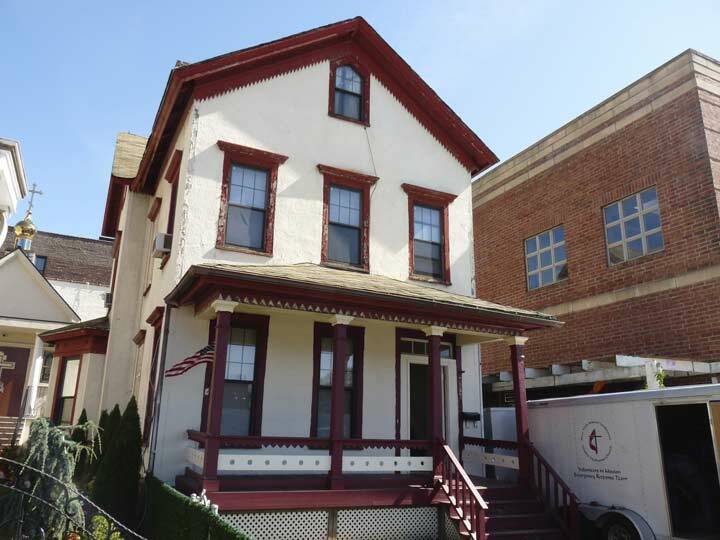 The building was once home to early 1900s cartoonist Winsor McCay, the creator of Little Nemo in Slumberland. 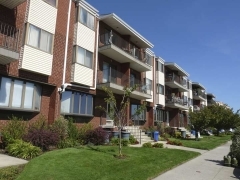 It was once in danger of being either torn down or converted to a homeless shelter, but fortunately it still exists, albeit with an ugly modern makeover. For those unfamiliar with Little Nemo, the late Tom Petty’s 1988 video for “Runnin’ Down a Dream” was a tribute of sorts to McCay’s artwork. 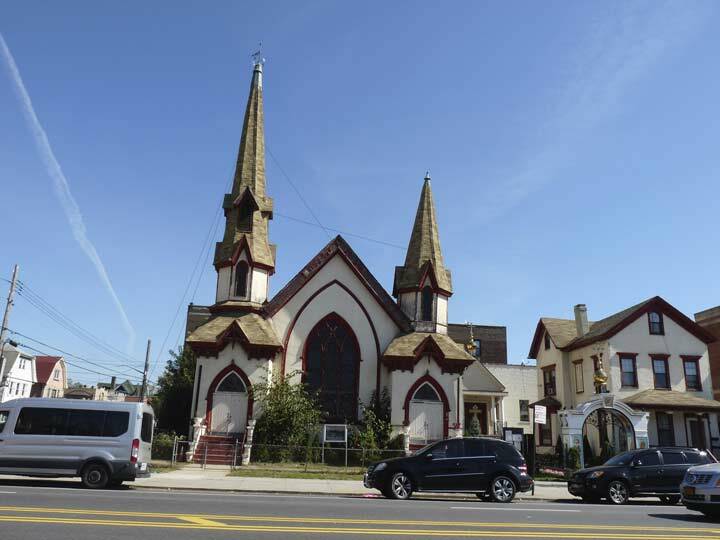 The magnificent mismatched steeples of the Sheepshead Bay United Methodist Church at the SE corner of Ocean and Voorhies Avenues are still standing, but it was a close call for awhile. 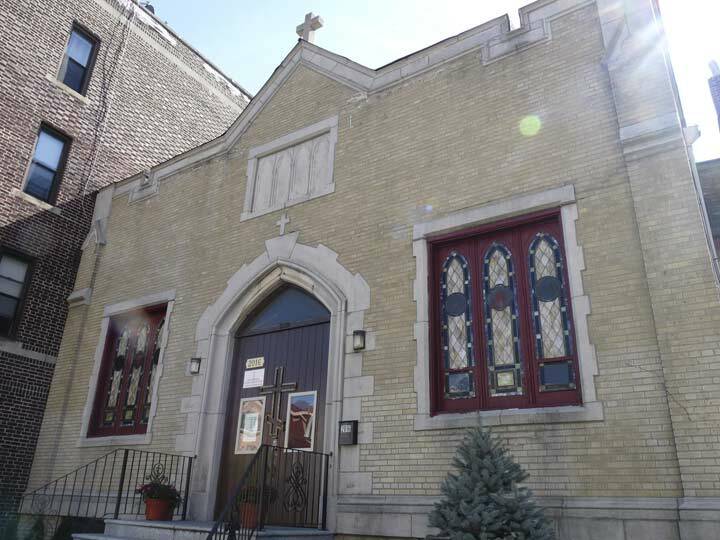 The congregation dates back to 1841, with this building erected in 1869 (with a 1925 renovation). In 2011 the steeples were in precarious shape and were about to be razed, but a last ditch attempt has stabilized them for now. Services are held in English and also in Korean for a small but loyal congregation. 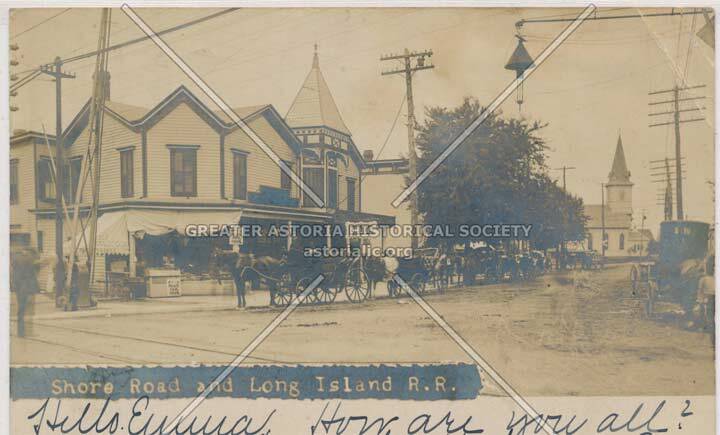 Ocean Avenue looking north at Voorhies, about 1910. The Methodist steeples are on the right. 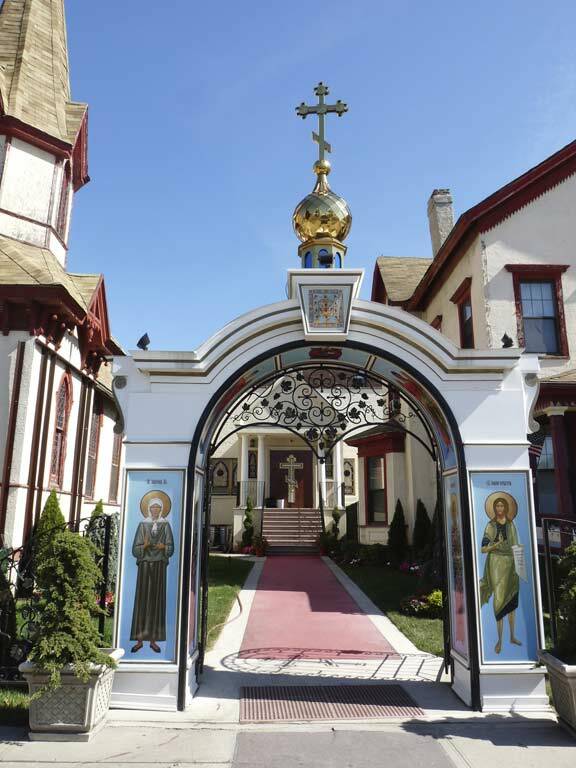 Next door is the Russian Orthodox St. John the Forerunner Church, with entrances on both Ocean and Voorhies, and not a stitch of English in the signage. 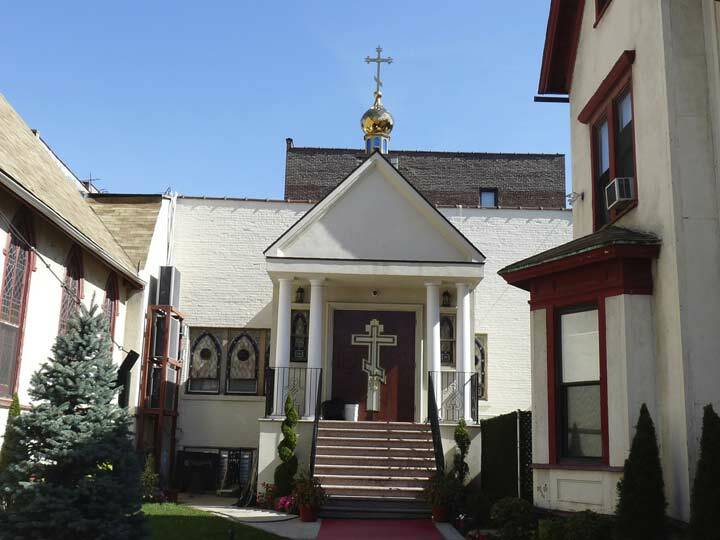 The Methodist parish house, constructed in 1930 on Ocean Avenue, is painted in beige and maroon to match the church. 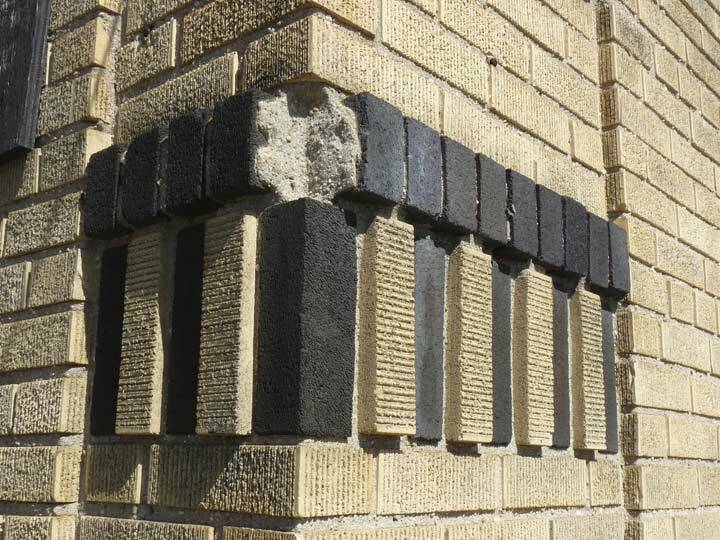 A look at the magnificent Deco building on the NE corner of Ocean and Voorhies, and a closer look at the alternating buff and black brickwork. As NJ 101.5 DJ Don Tandler (The Record Handler) says, they don’t make them like this anymore, and they don’t even try! NYC fire alarms have been produced in this particular style since 1912, with these slope-roofed designs. Original 1912 versions featured an interlocking FDNY on the base which is missing here, but my thinking is that this is indeed a 1912 original. The shaft that held an indicator lamp is still there, but with disconnected wires. Perhaps the power for the alarm is located beneath the street. 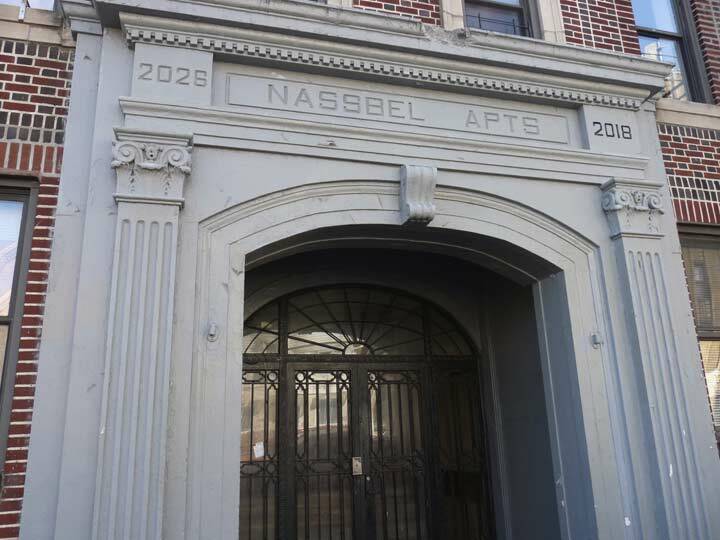 Nassbel Apartments, typical of apartment house construction from 1910-1925, at Voorhies and East 21st street. The name is likely a portmanteau of two of the developers’ names. 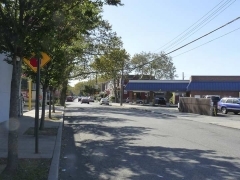 Voorhies Avenue is one avenue south of Avenue Z, and when the Town of Flatbush’s avenues were being laid out in the late 1800s, they ran out of letters, and named the street after Dutch town father Stephen Coerte Van Voorhees (1600-1677) whose descendants continued to own Sheepshead Bay property for a couple of centuries. 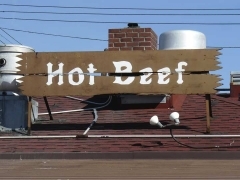 His name can be translated as “before Hees,” after a small town in Holland where the family originated. Somewhere along the way, -ees became -ies. 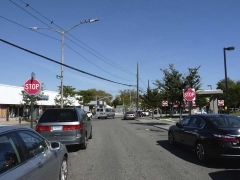 Emmons Avenue is one block south of the Belt Parkway and is an eastern continuation of Coney Island’s Neptune Avenue from the edge of Sheepshead Bay eastward. Early photos show it lining the bay directly, with fishing boats and sailboats berthed along its south side, with lanyards thrusting past the shoreline. During the 1930s a Works Progress Administration effort tamed the bay with concrete bulkheads and the avenue was widened. The north side used to feature Victorian-style mansions, but most of them are gone now and more modern housing has emerged. 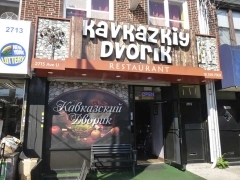 Nightlife clustered along Ocean Avenue and Sheepshead Bay Road has suffered as Lundy’s, the El Greco Diner, and Pip’s Comedy Club have closed, but seafood restaurants like Randazzo’s and our next featured item have survived. 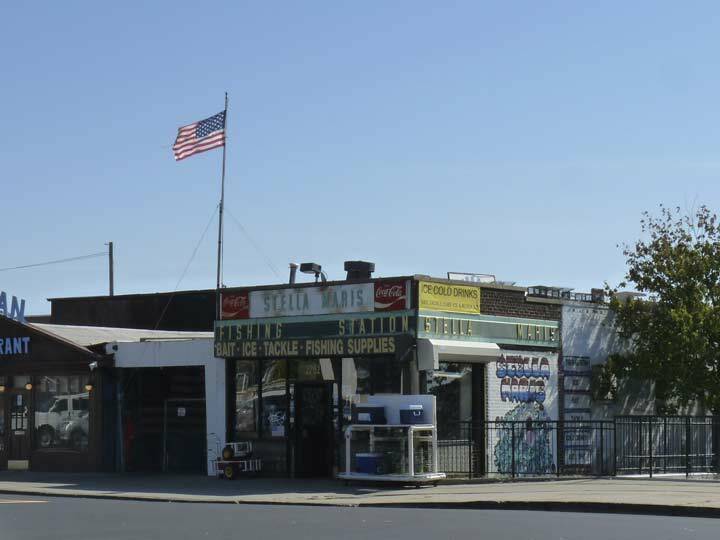 One of the few bait and tackle shops remaining in Sheepshead Bay serves the still-lively fishing and excursion boat businesses on the south side of Emmons. Stella Maris “Star of the Sea” features a 1950s Coca-Cola sponsored “privilege sign” with movable letters like a theater marquee. 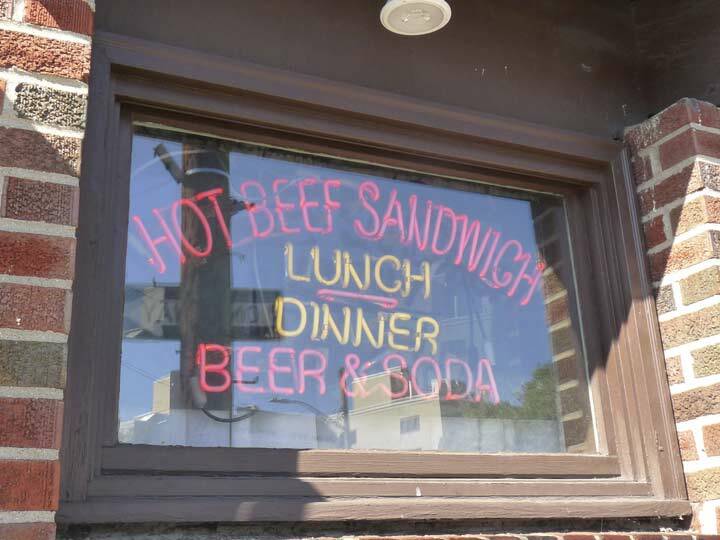 I am not the biggest roast beef fan unless it comes with plenty of stuff like thick gravy and pepper, so I’m not the best judge of its signature sandwich, but I do like the large, juicy burgers that are cooked medium, with some pink showing. I like the onion rings better than the french fries, which are disk-shaped, cut quite thin and occasionally overdone, so they come out more like potato chips (crisps, if you’re reading this in England). Nathan’s remains the undisputed fries champion in these parts. On a visit in 2015 on my birthday, I presented ID proving it and got a spin on their prize wheel. Wouldn’t you know it but I won the grand prize, five coins worth $25. I’ve eaten for free on my subsequent two visits! I headed up Nostrand Avenue, an important 4-lane artery. 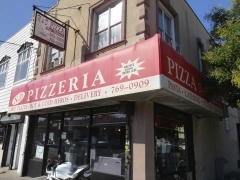 It’s one of the longest streets in Brooklyn, in my estimation in 5th place behind Flatbush Avenue, Bedford Avenue, Fulton Street and Atlantic Avenue. Believe it or not, because of the presence of the racetrack and the slowness of southeast Kings County to be developed, it was not extended south of about Kings Highway until 1931! 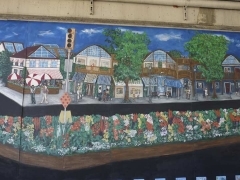 It was named for Dutch town father Hans Hansen von Norstrand, who arrived from Holland in 1638; his name meant “north shore.” The first length of road that became Nostrand Avenue opened in Flatbush in 1840. I have no idea how a shopping mall can be anchored by a Party City, but this is photographic proof. The other large retailer here is Rite-Aid, which makes more sense. 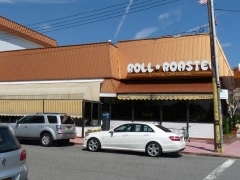 In the 1970s, I took a late night bus here on the B4 to a bowling league at Rainbow Lanes at Knapp Street and Avenue X, invariably followed by a bite at the Burger King across the street. I’d get home to Bay Ridge by 2, and got up for a 9 AM class at St. Francis College the next day. I was younger then. 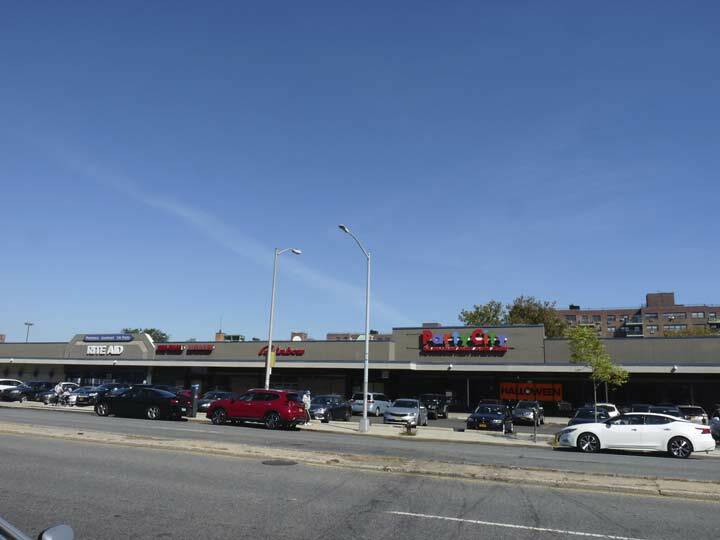 Both Rainbow Lanes, which was owned for a time by Brooklyn pro Mark Roth, and the Burger King have disappeared without trace. 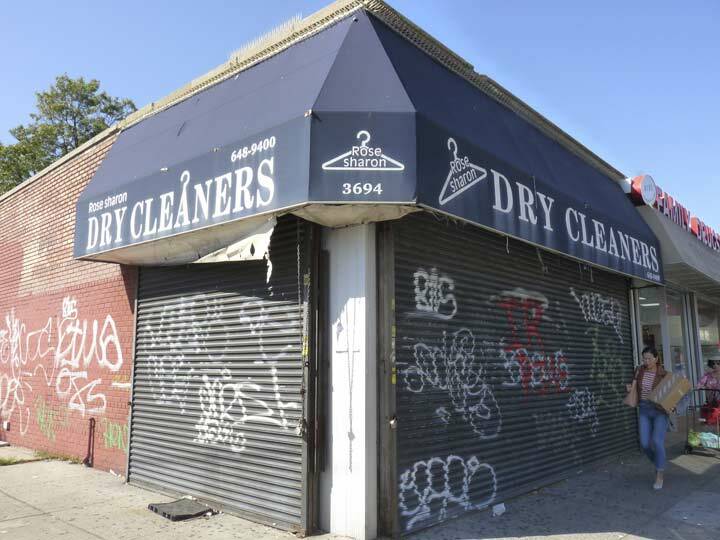 At Avenue X and Nostrand Avenue is the now-shuttered Rose Sharon Dry Cleaners. There could have been two ladies named Rose and Sharon running the place, but the name likely derives from the common purple flower often grown on hedges. 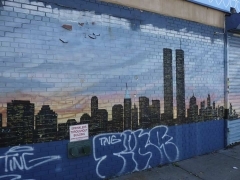 The shadow of the terrorist attack of 9/11/01 still hangs heavily in Eastern Brooklyn, from which many firefighters and rescue personnel hailed. 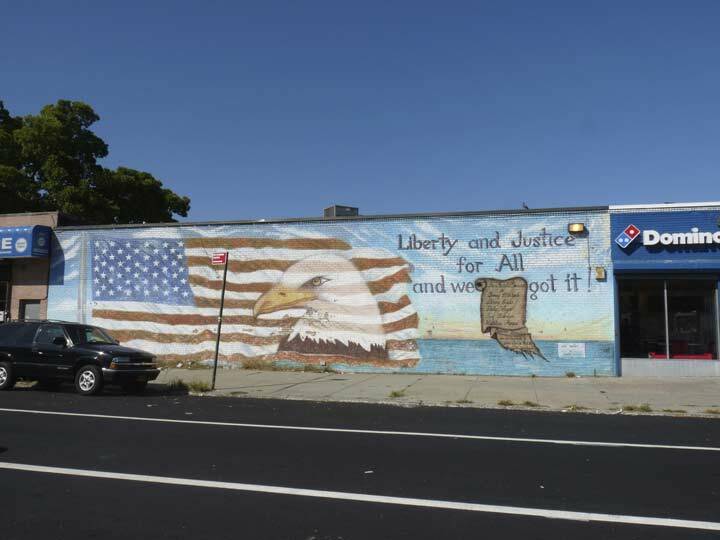 These are a pair of murals on either side of Avenue V at Nostrand. 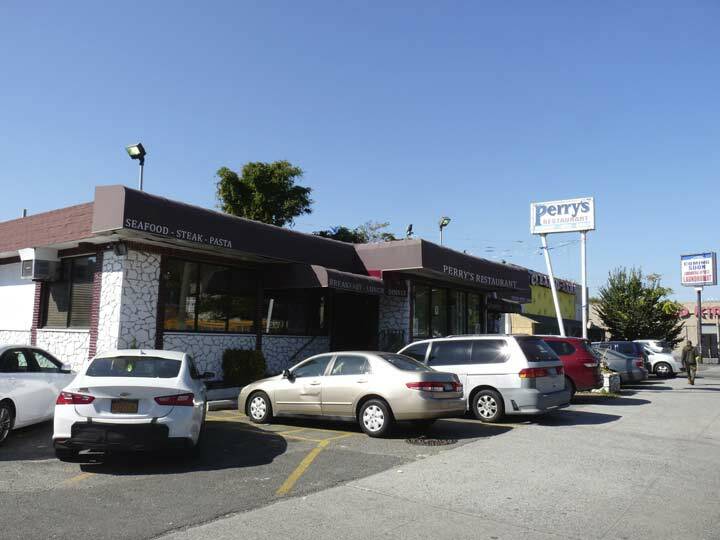 One more diner, this time on Nostrand between Gravesend Neck Road and Avenue V, is Perry’s Restaurant. 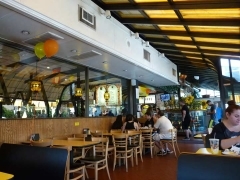 The diner, opened in 1990 by Perry Kokotas, specializes in seafood. 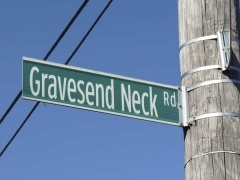 The east end of Gravesend Neck Road, once a major east-west artery in Gravesend and Sheepshead Bay. 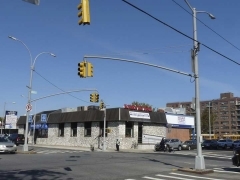 “Neck Road” as it’s called by locals, is along with Kings Highway and Flatbush Avenue one of Brooklyn’s oldest roads, having been here since the colonial era and likely built over an Indian trail. 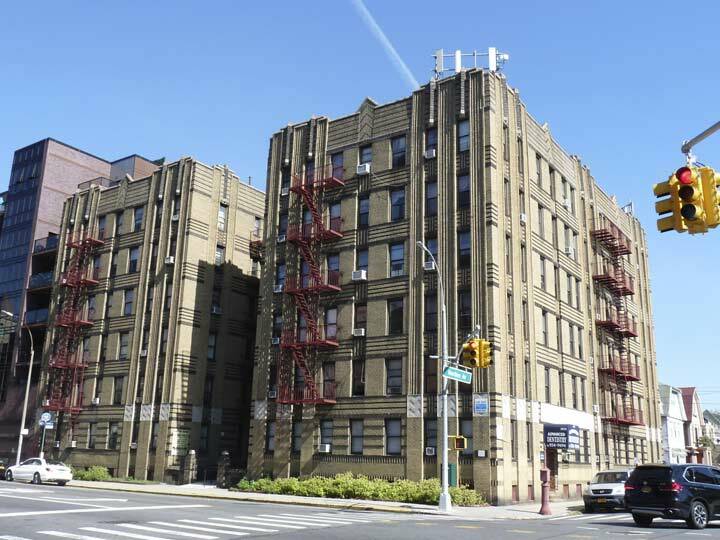 It runs from Van Sicklen Street southeast and northeast, crossing Avenue V twice and ending at Avenue U and Haring Street, though it once continued on to about Gerritsen Avenue. 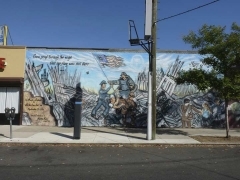 At its west end you will find the historic Gravesend and Van Sicklen Cemeteries as well as the now-landmarked Lady Moody House. 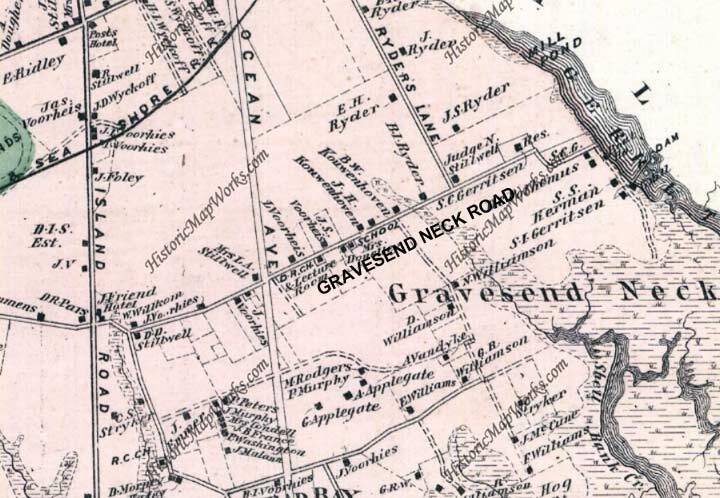 Gravesend is likely named for the British seacoast town, Gravesend, which derived from “end of the grove”; the less likely derivation is from the Dutch s’Gravenzande, “Count’s beach.” The “neck” Gravesend Neck Road goes to was in what’s now northern Sheepshead Bay and was likely a narrow strip, or “neck” of dry land amid marshier territory. Here’s an 1873 map of Gravesend and Sheepshead Bay. 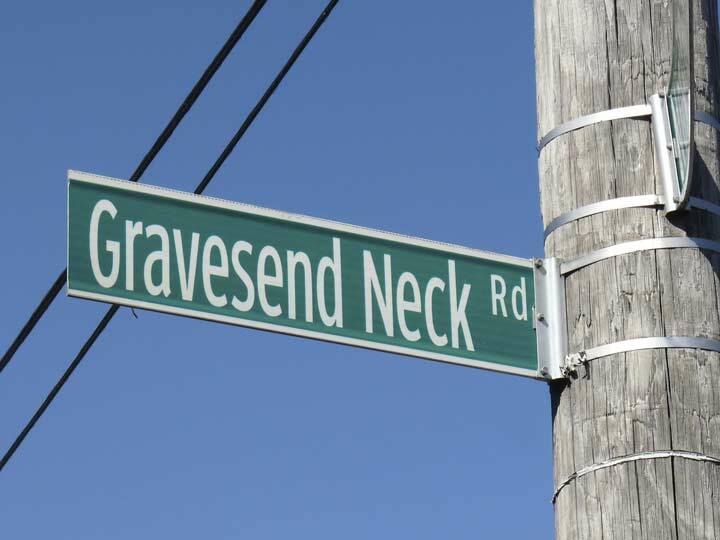 Gravesend Neck Road is one of the few existing roads along with “Coney Island Road,” now Avenue. The road at the bottom is Voorhees Lane, now Jerome Avenue, while Ocean Avenue was planned but not yet built. Ryders Lane, which cut diagonally across the area, has left little trace. The small squares represent houses and their owners. Each likely sat on a small plot of land that was farmed. 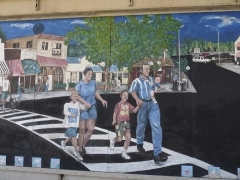 Names such as Ryder, Voorhees, Gerritsen, Stillwell and Applegate can still be found on street maps. 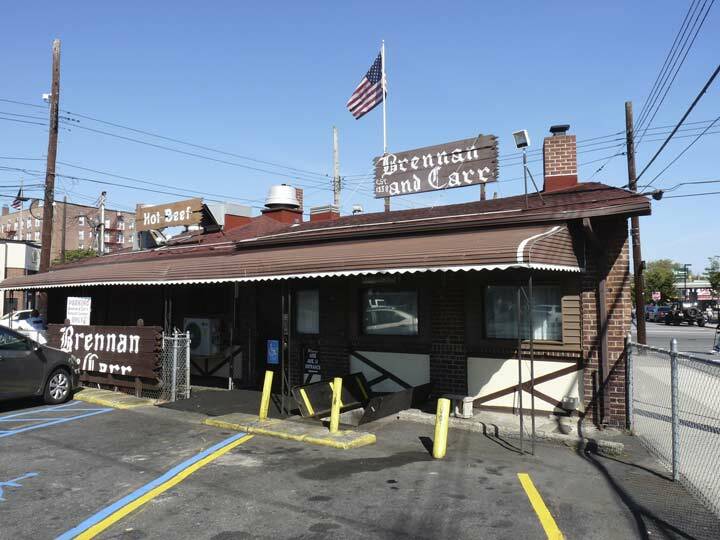 Brennan and Carr was founded in 1938 at Neck Road and Nostrand Avenue and has sold roast beef sandwiches as a staple from the very beginning. 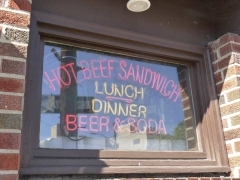 It’s famed for its heaping sandwiches au jus, served with fries and other sides. 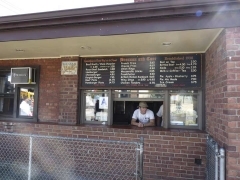 For years, its combo burger/roast beef sandwich (the Gargiulo Burger) was a secret item known only to regulars. Its hot dogs and desserts such as blueberry pie a la mode are also highly rated. Though it has a popular takeout window, it’s a sit down restaurant with white-coated waiters (as opposed to Roll n Roaster, which has a fast food vibe). 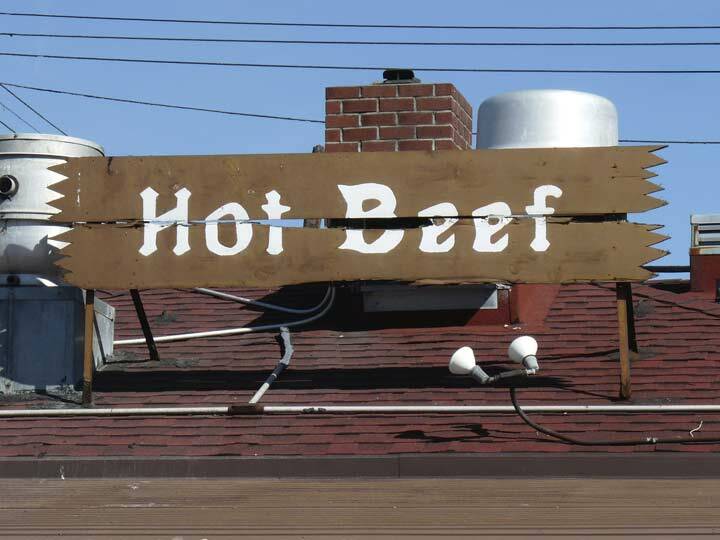 Unlike other venerable beeferies like Peter Luger, which specializes in porterhouse steak (though its lunchtime burgers are also highly scored), you can eat heartily at B & C for $15 or less. 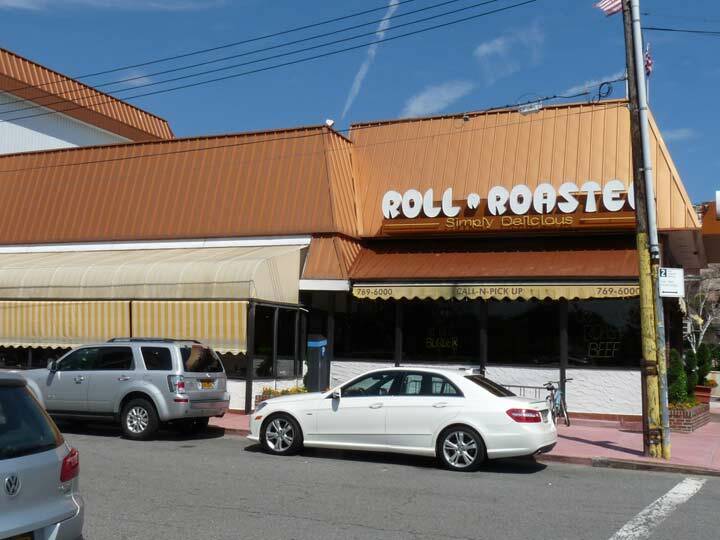 If roast beef isn’t for you, you won’t go hungry on Avenue U, since there’s an eatery for every nationality and taste preference along its lengthy route between Stillwell Avenue and Bergen Avenue in Bergen Beach. It’s one of the few “letter” avenues in Brooklyn whose route is completely uninterrupted. 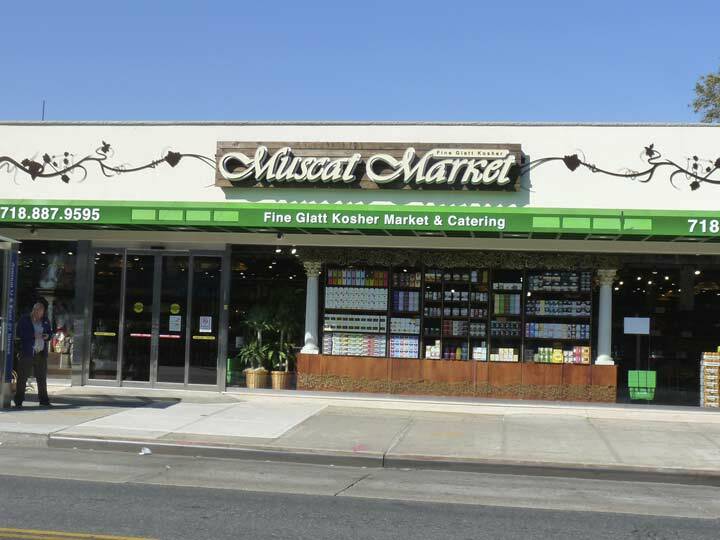 A Glatt Kosher supermarket, Muscat Market, holds down the spot at Avenue U and East 27th Street that Richard Yee’s Polynesian-style Chinese restaurant occupied between 1952 and 2009. 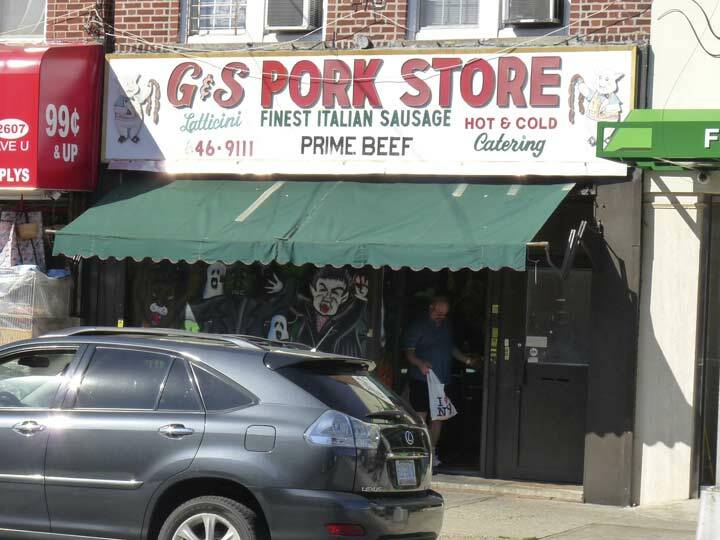 A traditional Italian deli, or “pork store,” complete with “animal cannibal” pigs holding strings of sausages, is next door to the Muscat. Formerly this stretch of Sheepshead Bay was more Italian in character. This 9-11 themed mural at Avenue U and East 27th Street is different from the other ones I have seen around NYC. 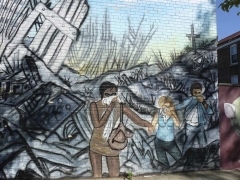 It depicts the smashed towers with people covering their mouths and noses struggling their way out of the ruin and FDNY and NYPD raising a flag (three firemen actually raised a flag). The artwork is by Joe Indart. Here he explains his rationale and technique. Making my way up East 28th Street, these attached brick residences remind me of certain blocks in Bay Ridge. 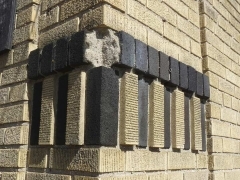 My affinity for brick residential architecture has been mentioned repeatedly in FNY. At 1926 East 28th, just south of Avenue S, we come upon one of two post-colonial era homes located in Sheepshead Bay and Marine Park. This old house dates to 1834. 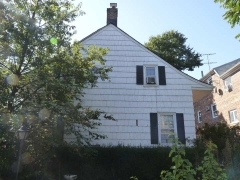 Elias Ryder inherited property in 1827 from his father Bernardus, who had fought in the Battle of Brooklyn in 1776. 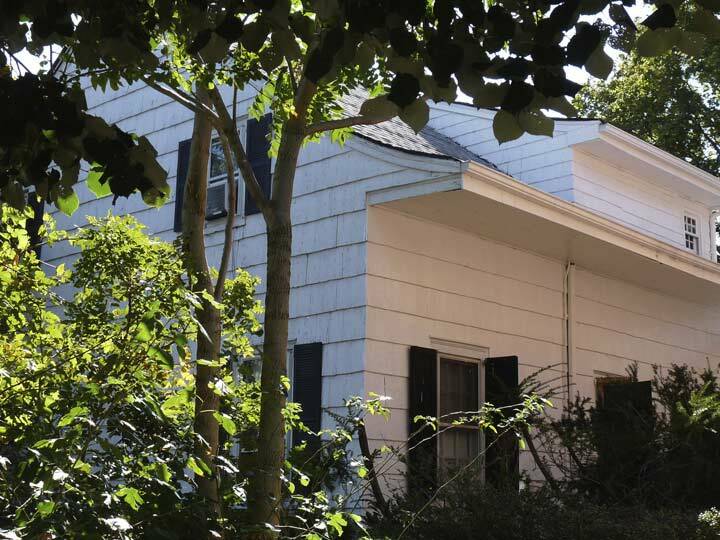 His father-in-law, John Stillwell, a carpenter and cabinetmaker, built the house, which remained in the Ryder and Hubbard families well into the 20th Century. 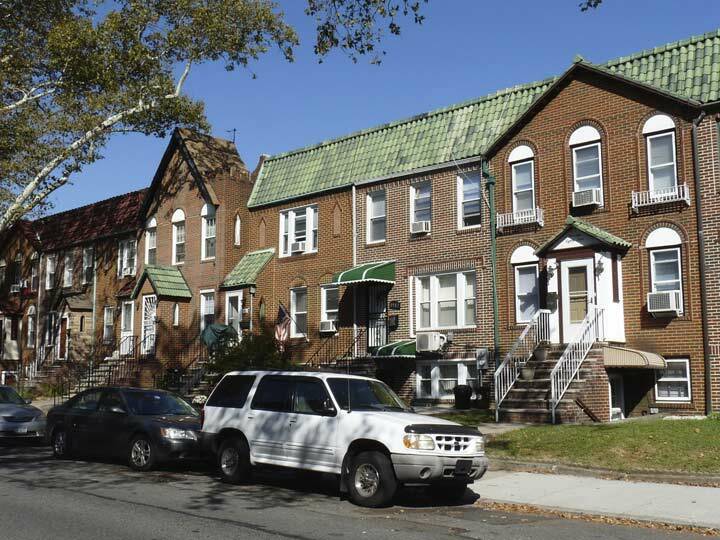 The Ryder family is still represented on area street maps, with Ryder Street in Marine Park and Ryder Avenue in Midwood. 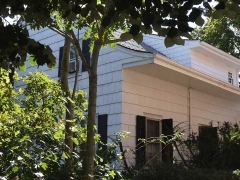 Forgive me for the unsatisfactory photos, but the house is on private property and warm weather foliage served to effectively hide some of the view. 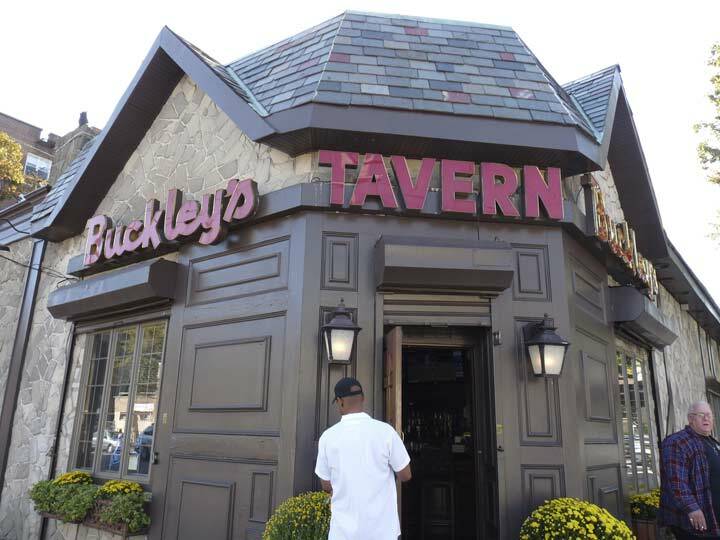 Walking east on Avenue S you pass Buckley’s Tavern, a Sheepshead Bay institution, and the third place I encountered today where the roast beef is recommended. Their website is bare-bones, providing no historical information, but I have attended two wedding receptions here as well as a 95th birthday party (not mine!) a few years ago, and it gives every indication of having been here for decades. If anyone knows exactly how long, let me know in Comments. OK, time to finish for this week, but next time, I’ll relate what I found after continuing into Marine Park and Bergen Beach in Part 2. 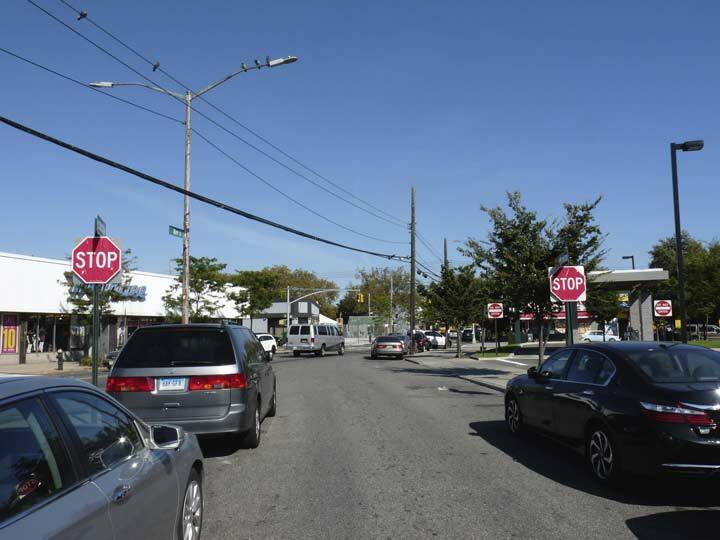 This article brings back many memories for me….My family used to use the B-36 bus and the the B-49 as an alternate method to return to our home in Flatbush after a pleasant day at the beach……We would board the B-36 at Surf Ave and 37th Street and take it thru Sheepshead Bay Road to Ocean and Emmons Aves where we would change for the B-49 bus to home……I also remember going to both Lundy’s and Tappen’s when I was a lad……Both restaurants were packed years ago, especially on Sunday afternoons and evenings in the warm weather……Thank you again for posting these pictures and information you provide…. Re: the lightbulbs. Those are compact fluorescent lightbulbs(CFLs). They are distinct due to their spiral shape, as opposed to the normal bulb shape you get from incandescent and LED lightbulbs. 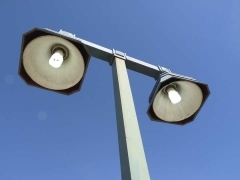 LEDs normally have two parts to them not counting the socket, but given the height of the fixtures likely wouldn’t be visible to you and would appear to be a normal incandescent bulb. Kevin, very thorough as usual. Just a few corrections and omissions. When you were a kid the B1 and B4 did not go to Sheepshead Bay from Bay Ridge. 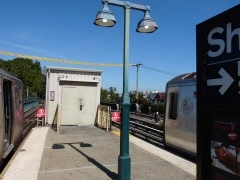 In fact there were no direct buses from Bay Ridge to Sheepshead Bay and two bus access also was limited. 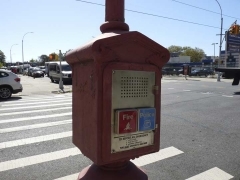 That was corrected on November 12, 1978 when the B4 was extended to Sheepshead Bay from 25 Avenue and the B34 was combined with the B1 which began at 25 Avenue . 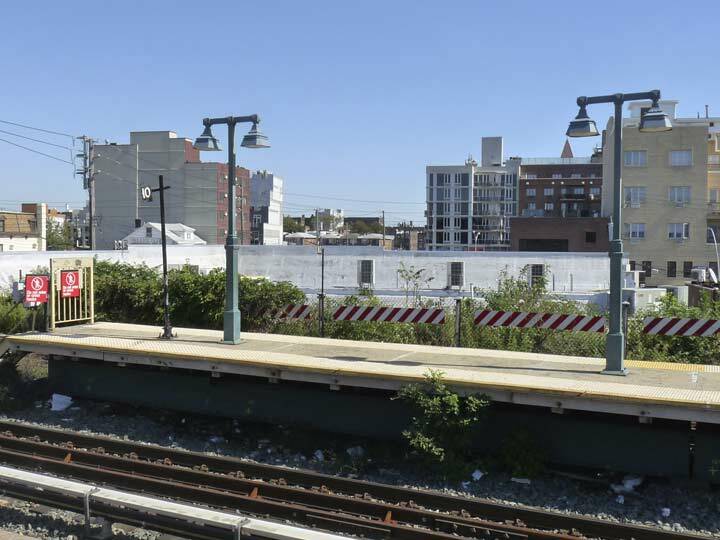 The B1 actually was rerouted from Sheepshead Bay to Brighton Beach. The Emmons Avenue roadway was widened a second time in the 1970s. 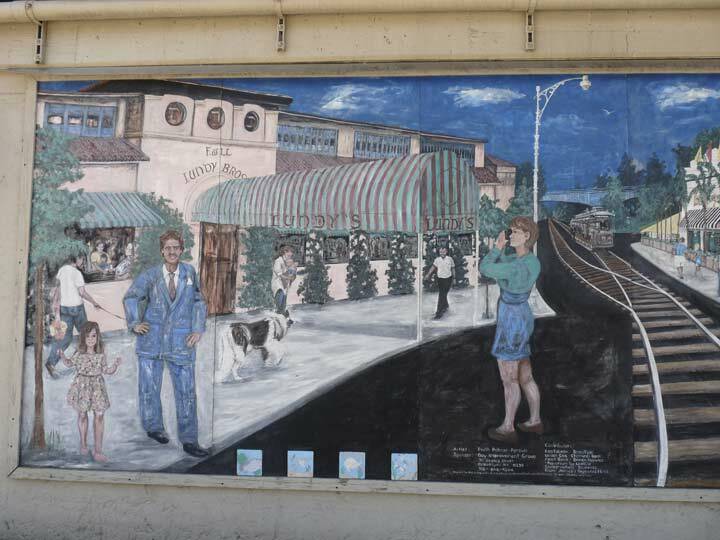 The man in the suit depicted in the Palmer-Persen mural is Steve Barrison, the head of the Bay Improvement Group. 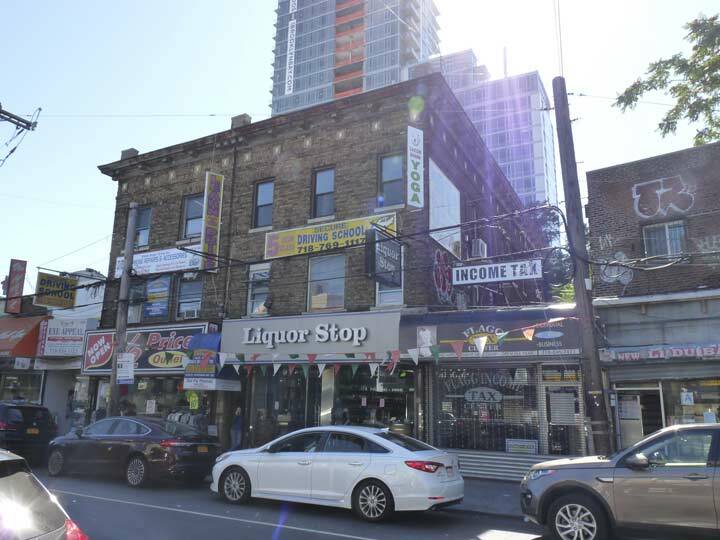 As far as the “ancient” building you refer to, I always wondered if it once were a corner building before the el was built, but cannot find any evidence of a street there on any old maps. 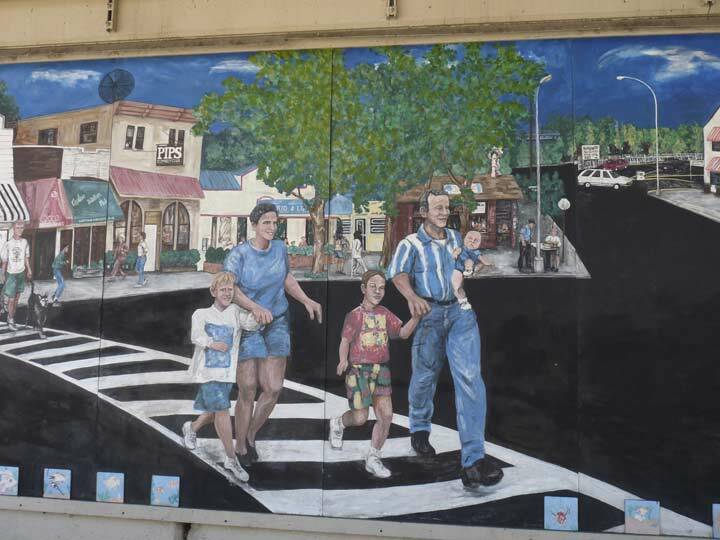 You didn’t mention that the recently closed off street by Bill Brown Square was where the railroad once ran on the surface and is the reason why it is there. 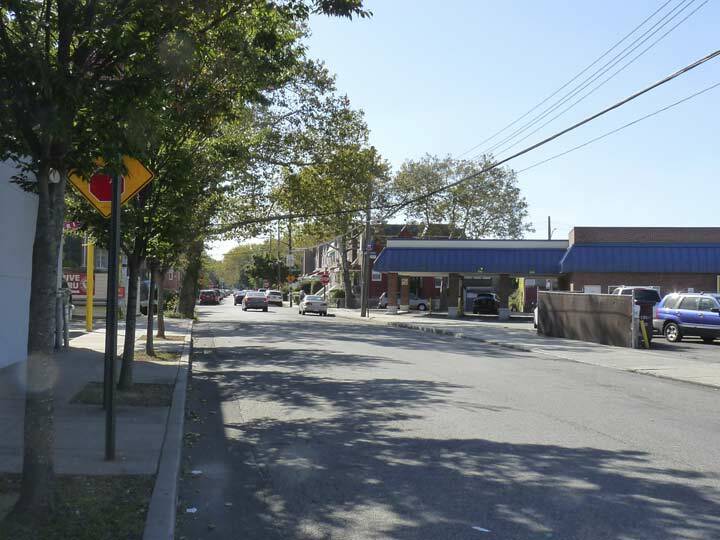 You found that ancient No Parking sign but missed the 1960s era B21 sign on Emmons Avenue that has been obsolete for 39 years since the B21 was discontinued as part of the bus route reorganization I mentioned earlier. You also missed the last remaining Victorian mansion on Emmons Avenue near the Sunrise Assisted Living. You mention you were on East 28 St, but you don’t mention that Google maps shows a stub of Jerome Avenue still existing off East 28 Street between Avenues Y and Z. You can also see some houses between Ford and Coyle Streets south of Avenue Z on what used to be one of the Kowenhoven streets. Don’t know if anyone still lives there or if they have been abandoned. (Haven’t been there in a while.) Many years ago someone stuck an old Brighton numbered sign on one of those unnamed streets. 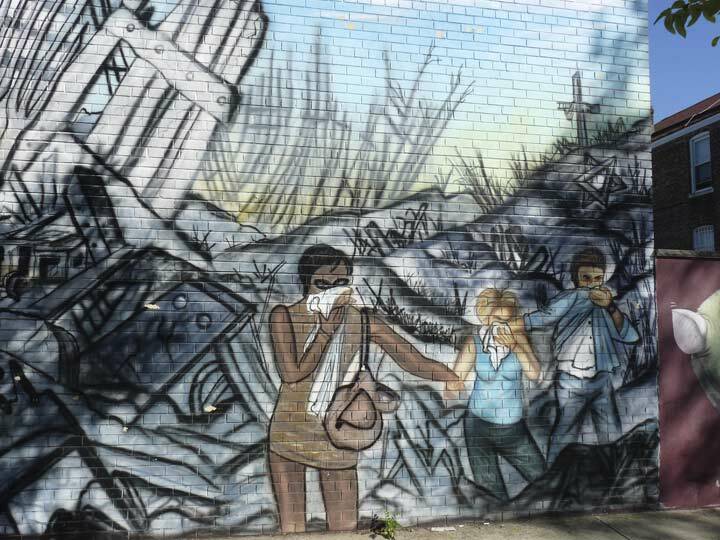 Anyone here have any information regarding when the widening of Emmons Avenue took place and how many homes were razed to facilitate the project? 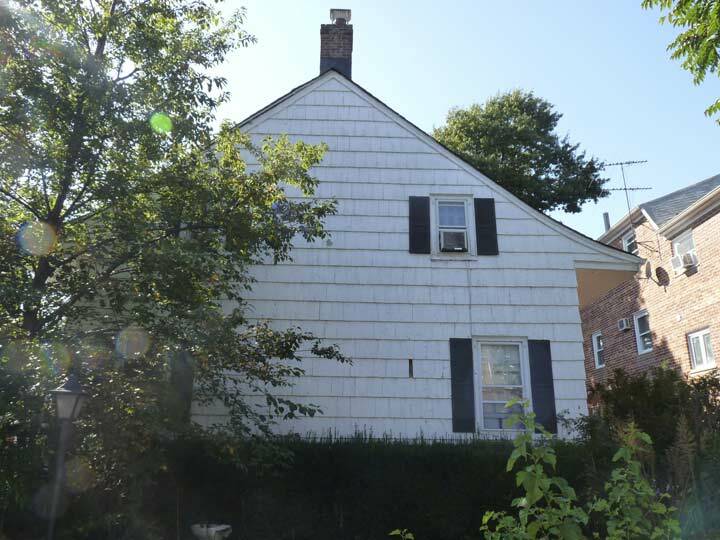 My grandfather grew up on Batchelder Road and we were always told that the house was the last one standing right next to the Belt Parkway. 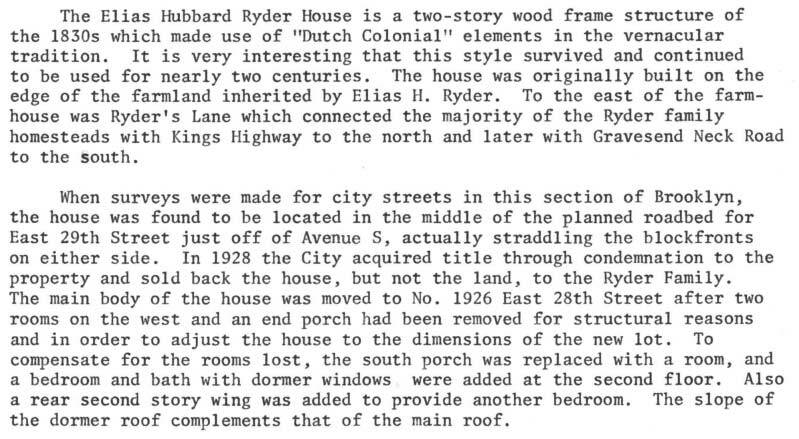 However years later we found some documents that showed the address being 2865 Batchelder Street. I drove down there and the house we always believed it to be was not that address. 2865 was south of the Belt Parkway. When I drove down to the other side of the Belt the numbers ended in 2800’s but didnt make it all the way to 2865. It appears the house is no longer there. Trying to get an idea of when it may have been knocked down….and I am thinking its involved with work that was done on Emmons. 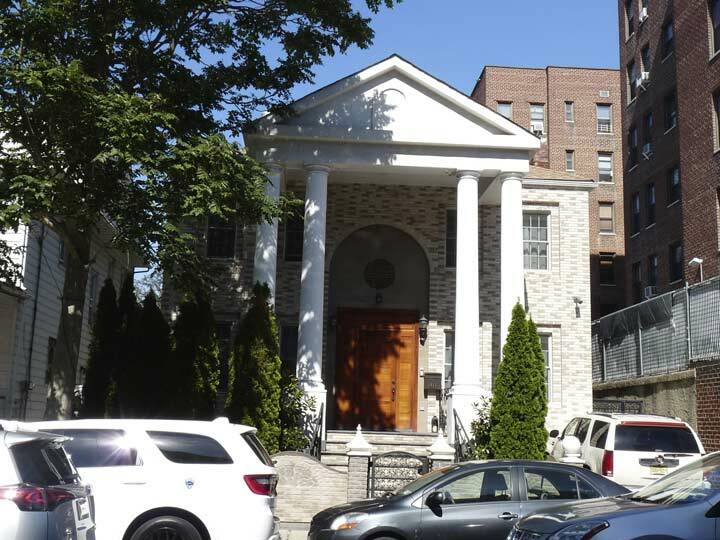 Wish I had known that that remarkable building (how beautiful it once was) had once been the home of Windsor McKay, who I studied in cinema class in the 70’s, all the hundreds of times I walked to the Sheepshead Bay stop from E. 28th street along Voorhies. Loved it and glad it’s preserved even if in garish form. 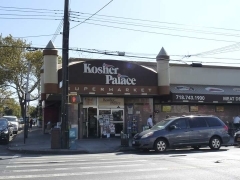 Missed a mention of the Kosher style deli Jay and Lloyd’s, on Avenue U, one of the few left in the city, and honored by the late Anthony Bourdain in one of his last programs for the Travel Channel before he moved on to CNN (that fount of fake news)! Thrilled to see that the Lott House is preserved, and also glad to see the notice of the house on E 28th, which I had always assumed was originally Dutch, and not Dutch styled. Glad someone else appreciates the Methodist Church on Ocean Avenue: I have always loved it. 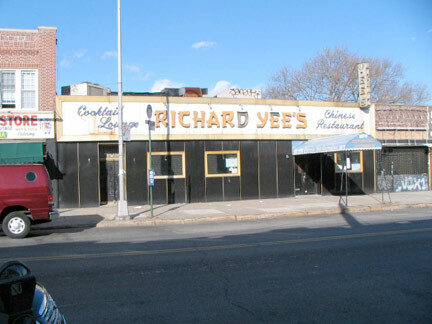 Haven’t been around in a while and did not know that Richard Yee’s is no more, though would have liked to have had Muscat when I still lived on Bedford. In your next posting # 2, you highlight the Catholic Church, Good Shepherd, near Avenue S. It was there that I myself serendipitously found my own stolen car parked right outside. When I did, I reported it to the police, who came and when I said, “Aren’t you going take fingerprints or anything?”, replied that all they would be doing was removing the all states alert on the car, so it wouldn’t stay as reported, stolen. What was the result of that? When I returned to Carrboro, North Carolina, I was pulled over at 4 a.m by three police cars, who accused me of stealing my own car! And why, by the way, did the original thieves douse the whole car in anti-freeze, anyway??? ?